This project explores collaborative choreographic process with multiple computational systems. A choreographer developed a piece by using one system to generate movement catalysts for exploring initial movement options and then iteratively constructed a choreography using an interactive system for capturing, manipulating and playing back movement phrases. 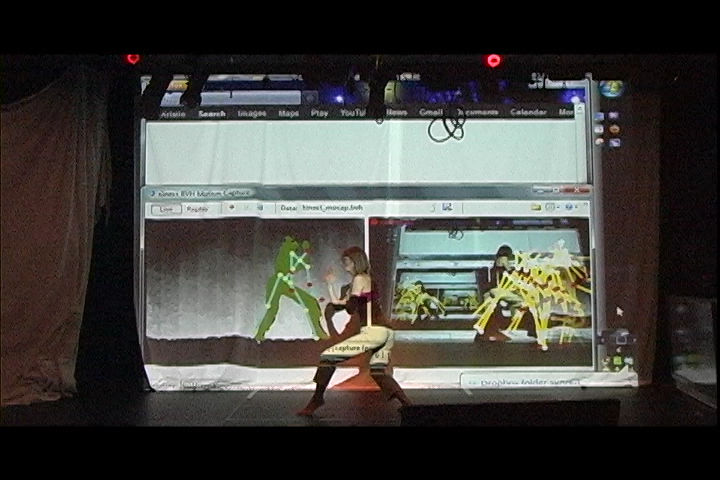 The purpose of this project was to better understand the collaborative creative process between choreographer and dancer to assess the potential use of an intelligent computational system in place of a dancer for producing creative choreography. Through documented reflections on the creative process, this paper presents our suggestions for how an intelligent computational system can better support a productive collaborative process.